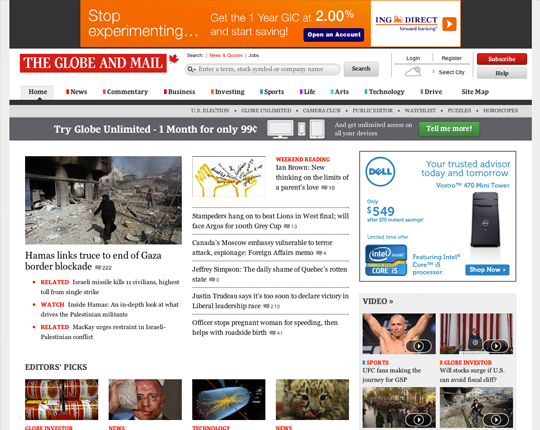 Involved with the creation and development of the Globe’s online content protection strategy (pay wall), as well as the development of site templates, and widgets. Moved Trendhunter.com towards a more semantic, accessible and google friendly site footprint. Helped to streamline the HTML and CSS using current best practices. Created custom infographic “HUD”, used to categorize trends using HTML, CSS and SVG. Front-end development using HTML, CSS/SASS, jQuery. 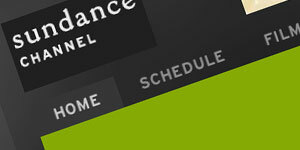 Responsible for taking client approved creative assets and turning them into functional, cross-browser web interfaces. 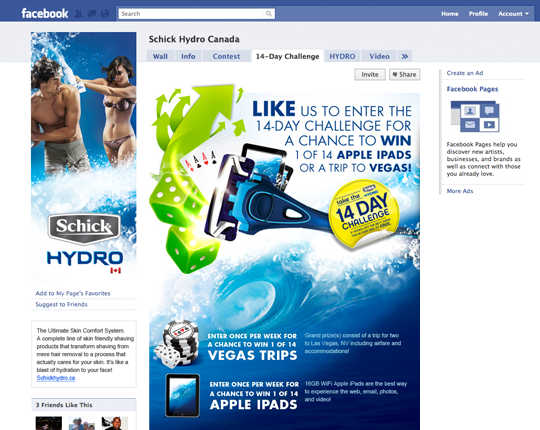 Specialties in this role include facebook fan pages, online contests, and micro-sites. Responsible for building client sites within Q4’s proprietary cms from flat psd’s into functional websites using HTML, CSS and jquery. 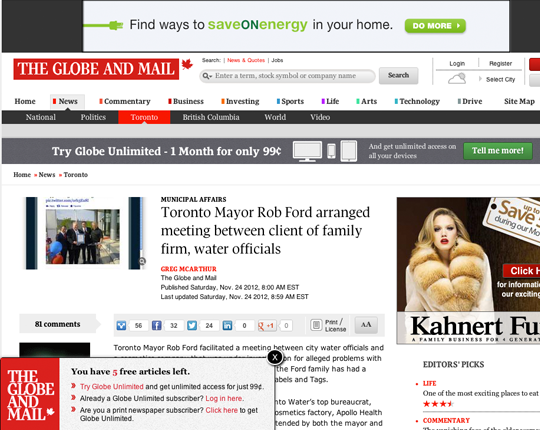 Built advertising templates, and “advertorial” content to be displayed inline on related kaboose properties. Designed client interfaces for “Autovera” product; including Enterprise car sharing, as well as Metavera corporate site and marketing materials. At Netsweeper I was responsible for the management and creation of all marketing initiatives both internal and for clients. 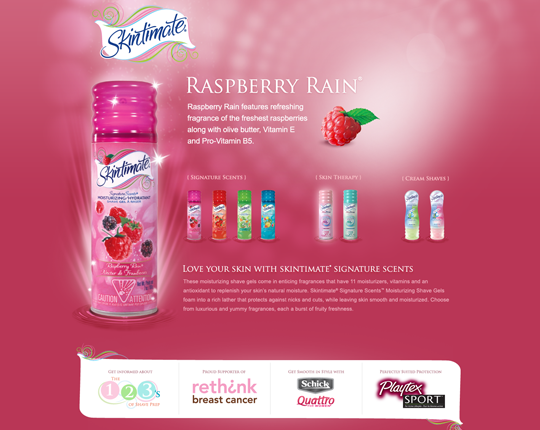 Over 4 years I created numerous campaigns for trade-shows and client needs, and worked with the development team in the UI design of Netsweeper core products and services. 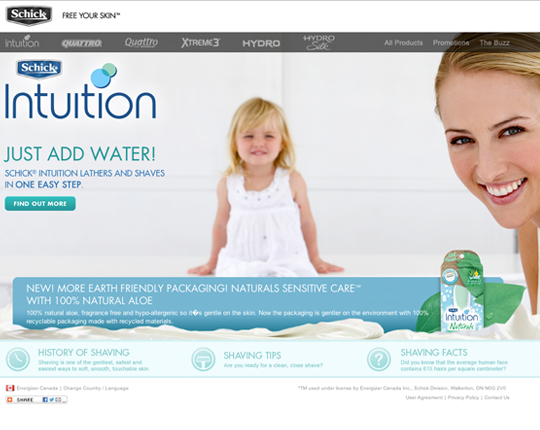 Designed and developed the UI for Tribenation.com using Flash, Photoshop, AfterEffects, HTML & CSS. I'm a Front-end Developer with 10 years experience working as both Dev and Designer. I have a diverse skill-set that makes me an asset to any project or team. 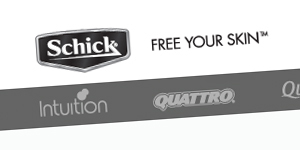 Let's talk about how I can help you! 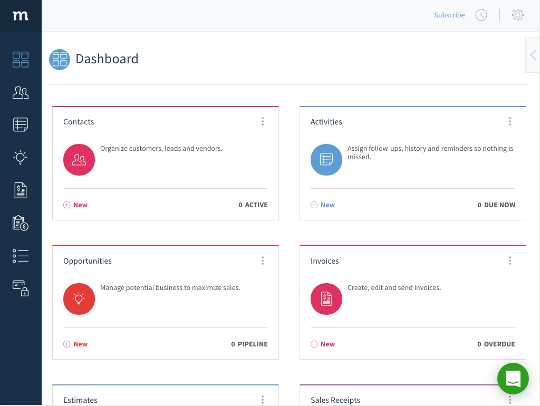 Built all UI Components and Templates using HTML, CSS/SASS, Foundation for Apps, AngularJS and jQuery. 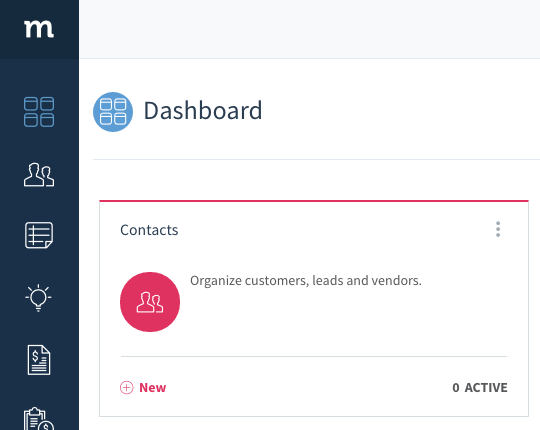 The goal of the interface was responsive and mobile first, giving the user the ability to engage with the platform on any device they choose. Method was complex in that the user had the ability to completely customize their experience, which meant having to build multiple structures and themes for each component and interface. I was brought into the Globe to work with the digital team on the creation and implementation of the digital subscription service. 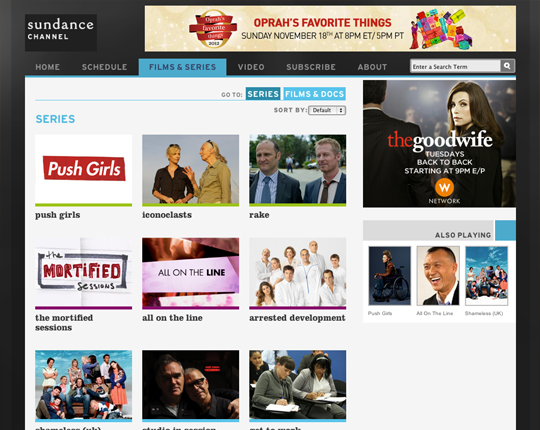 I was responsible for the build and implementation of the digital "paywall", and its components. 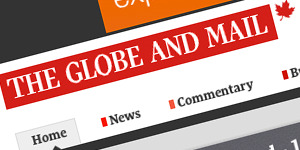 During my time at the Globe, I was also responsible for design work including the "Add to.. " functionality and the creation of an "author sprite", a large css image sprite of all the Globe reporters and contributors. 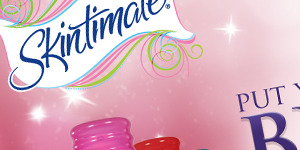 I decided that the sprite was the best course of action to increase page load times, and optomize site performance. 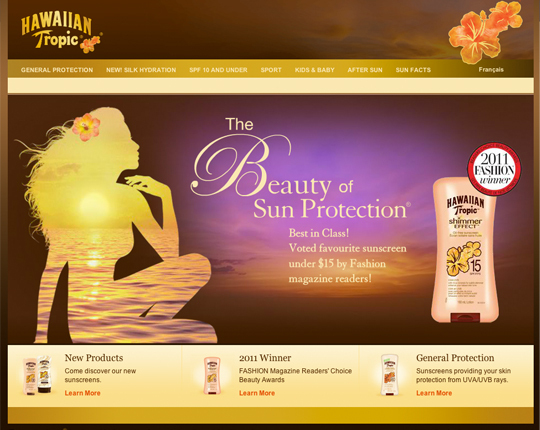 My primary role on the Hawaiian Tropic Canada page was re-factoring of existing code, including development and implementation of new HTML/CSS best practices as well as implementing newr jQuery methods in image and content handling. 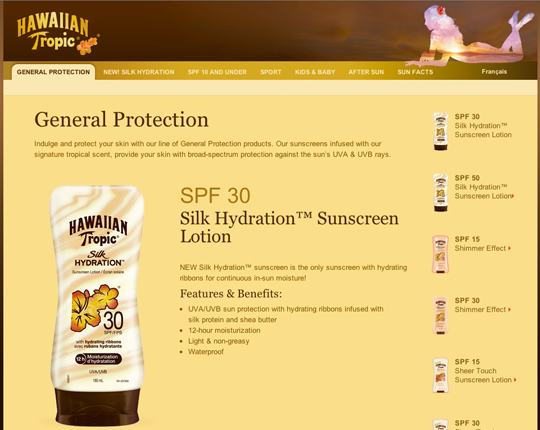 In addition to code re-factoring, I also updated product imagery and descriptions. 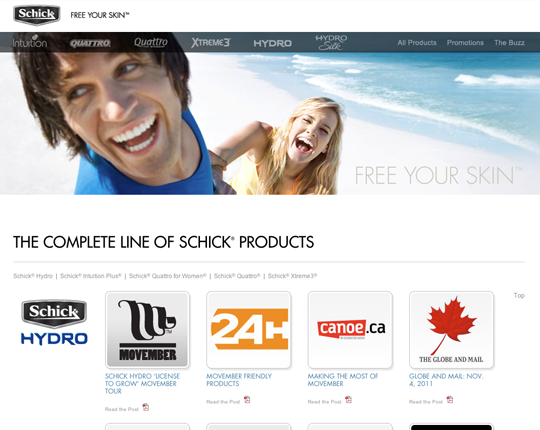 My role as the Front-end Developer on the Schick Canada consumer site was more involved with re-factoring HTML and CSS, and build out and implementing new plugins and jQuery work. In addition to the code re-factor, I was in charge of content updates. 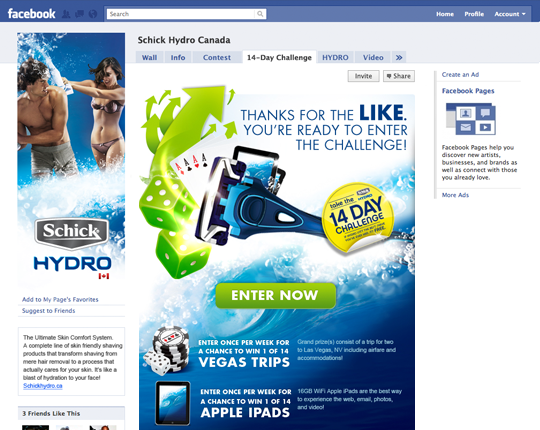 The Schick Hydro 14 Day Challenge Fan page was built as a fan gate, contest page and product page. 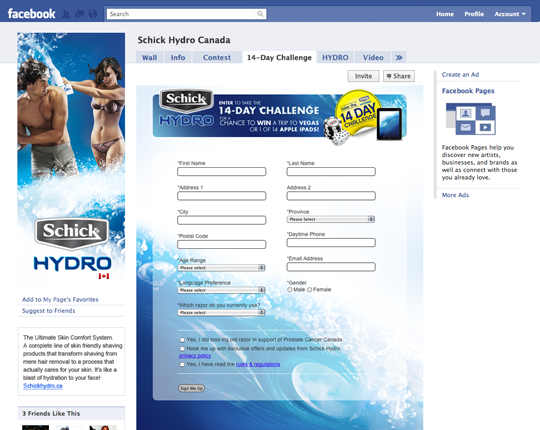 This was the first facebook page that Schich has in Canada. 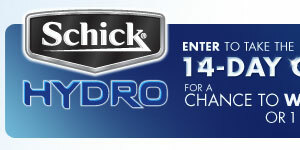 Each tab was build using HTML, CSS and the contest form was built with HTML, CSS, jQuery and PHP. 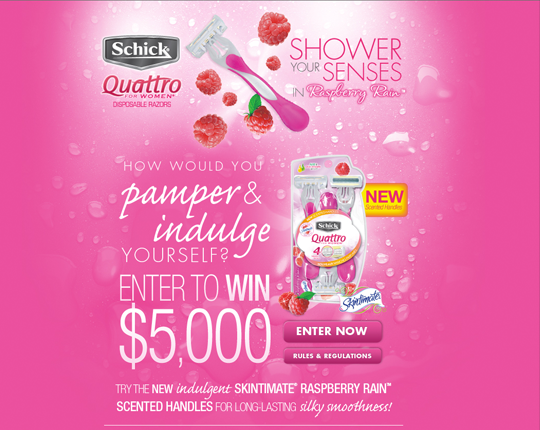 I was responsible for the build and implementaion of the "Shower Your Senses" contest page using HTML, CSS, and jQuery. The hardest part of the build was cutting and tiling the images so that they would properly expand and colapse with window resize (this was before responsive design). 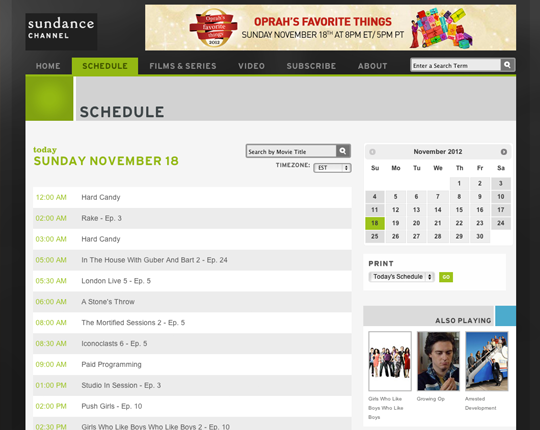 I was responsible for building the Sundance Channel Canada site from psd to pixel perfect website, using HTML, CSS, and jQuery. 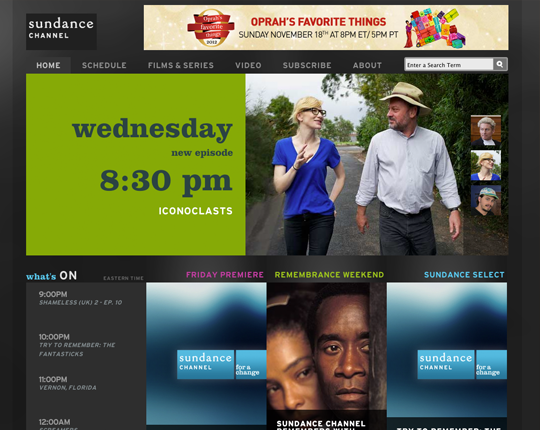 The site is running on an ASP.NET back-end. One of the challenges of this site was the schedule page, it needed to not only be dynamic in its content delivery but also in responsive in its layout, it presented the user with a large amount of information (7 days of programming). 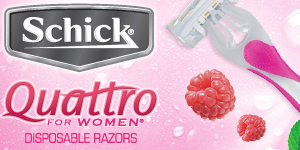 One of the largest websites catering to the "Mom space", The focus of babyzone was pre and post-natal information and anything baby related. 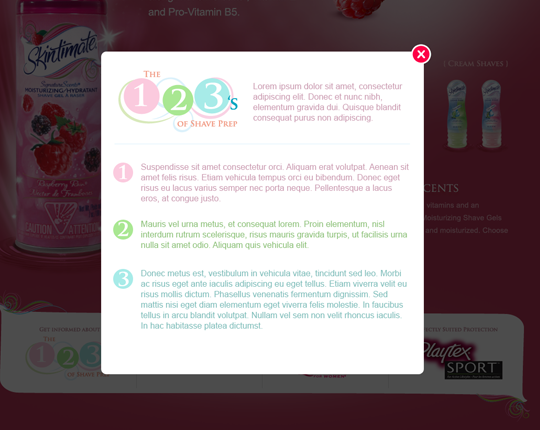 Built all UI's from flat psd using HTML, CSS and jQuery. I had the pleasure of working with Craig during a period when our company scaled from 20 to 60 Methoders. He rolled with the punches as our team grew, tried out new processes, and changed directions a few times. He showed leadership, and kept his teammates steered in the right direction. He is a very strong front-end developer. He implemented frameworks such as Sass, and foundation, and proved his ability to go from idea to production, and everything in between. He’s passionate about UI, UX, coding standards, semantic HTML, and was an active contributor within the team. He was more than a dev - when the scrum master was away, he’d step in to take the lead and keep things moving. I recommend Craig to anyone looking for a senior front end dev. Throughout the development of The Globe and Mail’s digital subscription project, Craig played a key role on the core team responsible for delivering the functionality required to identify subscribers and convince people who hadn’t subscribed to give the product a chance. I definitely recommend him to anyone who has difficult problems they need to solve well. Craig is a highly talented front-end web designer with a very high level of expertise and experience. He brought our company a wide variety of skills including: clean user-interface design, efficient use of plugins, and a high level css/html knowledge. He brought a sense of humor to the job that made him an enjoyable member of the team, especially when he mentored our newer developers. Craig brought a giant sized portion of experience, ability and technical mastery to the development team while also serving as a key leadership figure for the junior developers that reported to him. He was also a hilarious addition to the office and was pivotal in helping our advertising team execute some of our biggest client campaigns. Craig has a strong sense of User Experience and Usability. 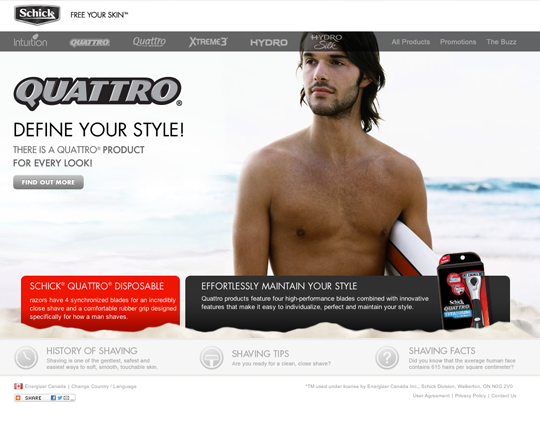 He has the ability to turn any design into a functioning website, built to today’s web standards. I learned a lot in the time working with Craig and recommend him to build and design any project you may have for him. 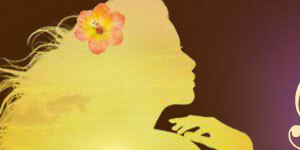 Craig is an exceptional artist and designer. He also understands the web very deeply, and always looks for the most programmable browser-compliant solutions. 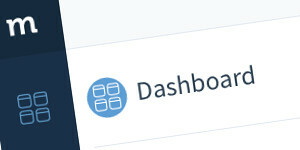 We continue to reap the benefits of the modern user interface he designed and coded for our product platform.